So said Ernie Gawilan, who was born with underdeveloped extremities. He has no legs and his left arm failed to fully grow. As if those were not enough challenges, the 22-year-old Davaeno also grew up an orphan in one of the Philippines’ remotest regions. And oh, he also happens to be one of the country’s best swimmers. Even before he was born, Ernie was already swimming against the tide. He almost died during an unsuccessful abortion when his mother tried to conceal her pregnancy by another man. His father, upon discovering the infidelity, abandoned them. His mother later succumbed to cholera when he was only five months old, leaving Ernie in the care of his grandfather. “I must have been a good swimmer even in my mother’s womb because I survived the abortion. I just swam,” joked Ernie during an interview with SPIN.ph. His life took a turn for the better when the late businessman Vicente Ferrazzini chanced upon the nine-year-old kid in a sitio in Buda, Marilog District and, feeling pity, convinced his grandfather to send Ernie to a training center for the handicapped in Davao City. The next thing he knew, Ernie was bound for Davao City for the first time and brought to his new home at the Our Lady of Victory Training Center in Sasa. There, Maryknoll sisters of St. Dominic and the other handicapped youth became his family. In 2000, Ernie was brought to Samal Island to be the housekeeper of a training center set up by the nuns. That was where he fell in love with the water, which Ernie said gave his life a semblance of normalcy. He happily realized that when dipped in the water, he looked normal. “I just floated on the water and swam like a dog,” he added. One day, swimming coach Mark Jude Corpuz saw Ernie struggling to swim. Corpuz recognized potential in Ernie and made him part of the PWD (persons with disability) swim team he was handling. The Forest Hills resort pool became Ernie's boot camp. His first swimming competition in the 2008 Philippine Olympic Festival in Cagayan de Oro City almost ended before it could begin when he faced disqualification after he left his swimming trunks in Davao. Undeterred, Ernie begged officials to be allowed to compete in drag-inducing cargo pants and finished a strong second in a field made up of some members of the national team for the differently abled. 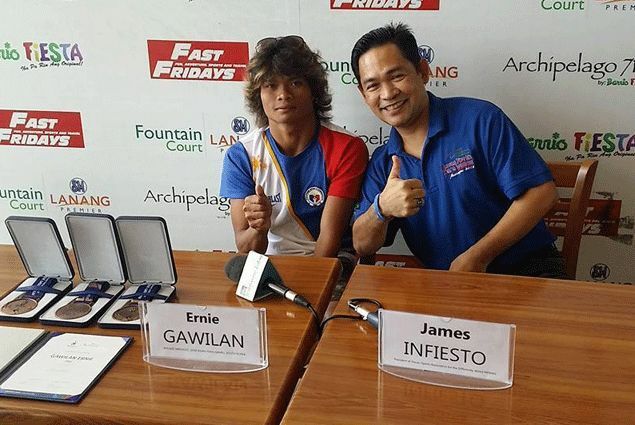 Ernie so impressed the winner, a national athlete from Iligan City, that he took him along to Manila. “Sabi niya isasama daw niya ako sa national team. ‘Di ako makapaniwala,” Ernie said. Under the tutelage of national coaches, Ernie reached his full potential. He went on to take part in competitions in Indonesia, Malaysia, Singapore, Myanmar, India, Japan, New Zealand and Italy and compiled a total of 15 international medals. 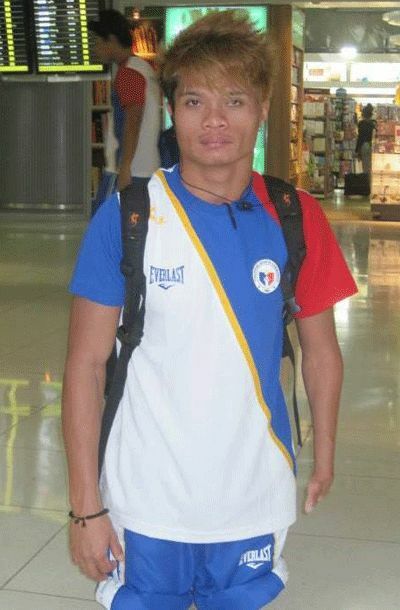 Last month, Ernie went to Incheon, South Korea to compete in the 2014 Asian Para Games, where he became the most bemedalled athlete of the Philippine delegation with three bronze medals. “Ang mga kalaban ni Ernie mga six-footers. Disabled pero matatangkad. Sa umpisa, naiiwan si Ernie pero pagdating sa second lap, doon siya bumabanat. Para siyang motorboat," said James Infiesto, president of the Davao City Association for Differently-Abled Athletes. However, it was not all rosy for Ernie when he came home. Republic Act 9064, or the Sports Incentives Act, has no such provision for differently abled medallists. While national athletes are entitled to a cash windfall of P1 million for gold, P500,000 for silver and P100,000 for bronze in Asian-level competitions, there is no such provision for differently-abled athletes. “I hope the government will realize the inequality has to be remedied. Our differently-abled athletes deserve to be equally treated like abled athletes,” Infiesto said. Ernie is still bound to receive incentives for his achievement from the Philippine Sports Commission (PSC), although way below the incentives guaranteed by RA 9064. “We will surely be happy if they give us attention,” Ernie said. Ernie, however, was quick to shrug off the inequality, saying he is currently focused on his biggest mission yet: the Olympic qualifiers in May 2015 in Canada and the United States for the 2016 Paralympic Games in Rio de Jaineiro, Brazil. “Gusto kong mapasali sa Olympics. Pangarap ko 'yan,” said Ernie. At present, Ernie is back in the comforting embrace of his adoptive family at the Our Lady of Victory where has lived - and thrived - for the past 14 years. He also found a second home in Samal Island whose waters opened up a world that recognizes him for what he truly is - a world-class athlete.